First of all I look forward to meeting the current team at SACC-GA and listen to their experiences from their time in Georgia. I also very much look forward to getting a closer insight into the American business culture, and getting a deeper knowledge of the overall American culture. I look forward to exploring where Sweden and America differ, where we are alike, and how we can create more business opportunities between the two of us. And of course to meet Linn, the other intern, who is arriving in March! What will you bring to your position and SACC-GA? I hope to bring energy and enthusiasm to a team I know already have a lot of both! I also hope to contribute with my experience as a Project Manager and with my passionate interest for Communication and Sales. A more developed understanding of the organizational structures of American businesses, deepen my cultural perspective, and many new conversations! I’ve been a faithful subscriber to the comic book “The Phantom” for many years, and it took me a while to pack and store my collection in preparation for my trip to Georgia. I’m a skilled cook and frequently work as a chef in restaurants around Stockholm. I love red things. My current favorite piece of clothing is a bright red woolen scarf. I have two idols. My Sister and my Brother. My Sister is one of the smartest and strongest people I know. My Brother is my role model of bravery. He is determined and pursues his ambition of becoming an actor. Once again: welcome to the team, Jonna! SACC-GA’s fall 2017 trainees have soon completed their time with the chamber and they are both looking forward to new adventures here in Atlanta and back in Sweden. Read on to learn about some of their achievements of this fall and the new adventures that await. 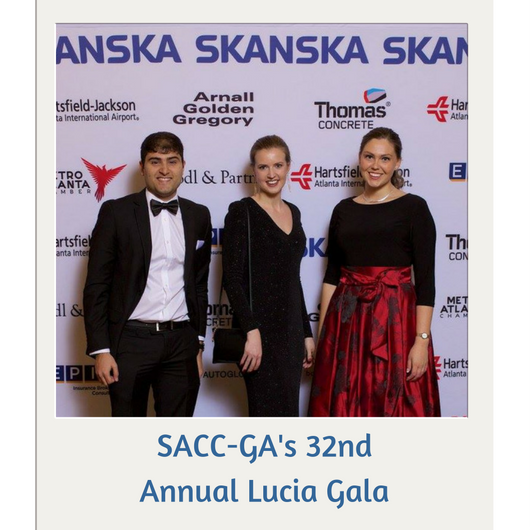 Favorite memory: When the board members told us how happy and positive they were about our work with the Lucia Gala. It was the first time that I was a part of planning such a large event, and to get that positive feedback just felt amazing. Like most about Atlanta: Definitely the southern hospitality! Best learning experience: Meetings with current members and target companies. It has given me an understanding of how business is done in the US and has been very rewarding. I’m proud of: This will sound slightly patriotic…but I’m proud to have been a part of Sweden abroad for a full year, not only here in Atlanta but also at the Embassy of Sweden in Thailand. Next step: I’m staying in Atlanta actually. I’ve landed a second trainee position as a project coordinator for cross-cultural teams with Processminer. Favorite memory: When Ulrika sang ”Fire” at the first release party we went to at Bravo Ocean Studios. Atlanta has a great music scene and I’m so glad I got to experience it first hand. Like most about Atlanta: That it’s so international and vibrant. There’s always something going on, there’s tons of great restaurants and parks and places to hang out. It’s a fun place to be. Best learning experience: When the venue closed 2 hours before our fall wine tasting event. The whole process of cancelling, setting a new date and starting over with marketing etc. gave me valuable practical experience and I learned a lot about event management in the following weeks. I’m proud of: The fika event we did at Bufab USA. It was the first project with the chamber I managed and coordinated on my own and it turned out nicely. Bufab Sweden even distributed the marketing material internally, which was exciting. Next step: I will end my internship at the marketing department of Elekta Inc. in January and February. It’s a great opportunity and I’m excited to learn from the Atlanta marketing team before heading back to Stockholm and the Elekta headquarters in March. It seems like the SACC-GA internship truly got my career off the ground! Thanks to photographer Randy McDow we can share the glamour of the 32nd Annual Lucia Gala with you. We hope to you again next year! Hartsfield-Jackson Director of International Business, SACC-GA Board Member and nominee Alrene Barr got the opportunity to join the SI visitor program ”Smart Business – Public & Private Sweden” in October where the importance of CSR, politicians connection to the private sector and universities, and children’s rights were central topics. The program gave insight into how business can be done in a smart way by involving the triple helix – government, universities and private sector – when creating new policies. The Swedish Model, Children’s Rights and corporate social responsibility requirements in Sweden were some of the topics covered during the four day program in Stockholm. Six international delegates were selected for the program and in addition to the US, India, Mexico, Nigeria, Qatar and Turkey were represented. The open and transparent culture of Sweden showed clearly on the day where a tour took the group walking straight through Parliament building with no metal detectors in sight. To mix in a bit of private sector one day was spent at the technology park where the Research Institutes of Sweden, RISE, and companies such as Ericsson and over 100 testbeds and demonstration facilities reside. That the Swedish government has a Minister of the Future, wants to be a driving force on UN goals, has strong CSR policies in place and sees the future as a business opportunity to forecast and invest in were some key take aways from the program. Alrene hopes to be able to visit Sweden again, in July, when the Swedish politicians and parties meet in Almedalen on the island Gotland to promote themselves, meet the voters and hear what they have to say. The journey’s goal was to strengthen the already existing relationship between the American Southeast and the Swedish community and to expand opportunities for trade and development between the two. Perhaps now a new direct flight is up for debate? Talk on “New U.S with Trump” in Gothenburg – a great success! SACC-GA board member and Arnall Golden Gregory LLP partner Tycho Stahl was one of the keynote speakers together with Mike Whitacre, Frazier & Deeter, LLC, at FKG’sAnnual Motor Supplier Forum in Gotherburg Sweden on October 18-19. Their talk about the “New U.S with Trump” with moderator Lennart Ekdahl (Swedish journalist & TV-personality) was a great success! Through the Swedish Insitute Visitors Program, and thanks to a nomination by the Swedish-American Chamber of Commerce Georgia, Immanuel Otterski, and corporate member gatc L.P., got the opportunity to spend 8 September days in Sweden. Fascinated by the international mindset amongst entrepreneurs,the traditional food and the humble but opinionated Swedes Immanuel and gatc L.P. are now more excited than ever to reach Scandinavian companies looking west. As a german-founded company helping businesses to a physical presence in the United States naturally gatc’s first clients were from Germany. The company has grown over the years and now has clients from many European countries and they keep expanding. A couple of years ago they started looking towards Scandinavia and joined the SACC-GA network. — We depend on our network. We don’t just pick up the phone, call a company in Europe and ask if they want to expand to the US, Immanuel Otterski, gatc L.P.
With SACC-GA as their only Scandinavian contact Immanuel saw an opportunity when Executive Director Sara Persson asked to nominate him for the Swedish Institute’s Visitors Program. An opportunity to start building a network in Scandinavia and reach new companies who want to enter the US market. — If you want to reach a new market you need to build and increase your network, and then maintain it, he states. With a smile Immanuel says that it was sure not going to happen but then the accept came, the dates aligned perfectly with a work trip to Germany and since he had personally never been to Sweden it seemed an exciting opportunity. The 8 days in Stockholm, themed ”Tech and Digitalisation”, contained visits to start-up incubators, e.g. SUB 46, Stockholm Tech Fest and knowledgeable guest speakers. The program also promoted Swedish culture and food. Meatballs and lingonberries, kroppkakor, toast skagen and even moose carpaccio was on the menu. The delegation consisted of 25 people from all over the world, who didn’t know each other, and Immanuel expresses how fascinating it was to see how this diverse group could engage in interesting conversation without arguments on politics or religion. — It’s wonderful to see that there is still room for open and healthy discussion without stereotyping. When it comes to Swedish culture and the swedes themselves it seems that the cashless coffee shops, the functional ”ecosystem” between university, state and entrepreneurs and the food has inspired Immanuel. He mentions how everyone was fluent in english, something that removes many hurdles in communicating with other countries, and that even the smallest start-up looks to the world beyond the borders of Sweden. — I could tell that whatever they do, they do it because they want to branch out and go international at some point. WE ARE NOW ACCEPTING INTERNSHIP APPLICATIONS FOR SPRING 2018! Interested in International Business and Trade? Want to expand your professional network and gain experience from working independently in an international and dynamic environment? Then a SACC-GA internship is definitely something for you! As an intern at The Swedish-American Chamber of Commerce-Georgia you will get the opportunity to develop both professionally and personally. We are now looking for driven and hardworking individuals with a can-do mindset. You will need to be able to work independently under supervision and be involved in various projects simultaneously. Being service minded is just as important to us as your professional skill set. Click on the job descriptions for application details. The position is based in Atlanta, Georgia. The city of Atlanta is home to almost 500,000 people and is located at the center of the 9th largest U.S. metro region with over 5.5 million citizens. Atlanta hosts the U.S. headquarters to world-renowned companies such as Coca-Cola, Delta Air Lines, SunTrust Bank and CNN. Atlanta is the business hub of the Southeastern U.S., offering southern charm and world-class sophistication. The Swedish-American Chamber of Commerce Georgia, or SACC-Georgia, is a non-profit organization that offer business services and events to its members and develops and cultivates business opportunities and relationships through a unique international business community. The primary objective of SACC-Georgia is to encourage and promote an exchange of business, trade, investment, technology and culture between Sweden and the state of Georgia. SACC-Georgia is one of 19 regional chambers across the United States, cooperating under the umbrella of SACC-USA based in Washington, D.C. The Swedish-American Chamber of Commerce Georgia was proud to take part of the official opening ceremony of DreamHack Atlanta 2017 , together with the Swedish Honorary Consul-Designate Mr. Tom Rosseland, Secretary of State candidate Buzz Brockway, Brennen Dicker at SIM Digital and Asante Bradford at the Georgia Department of Economic Development. DreamHack is based in Jönköping, Sweden and is the world’s largest digital festival. THANK YOU FOR ATTENDING SWEDEN DAY 2017! 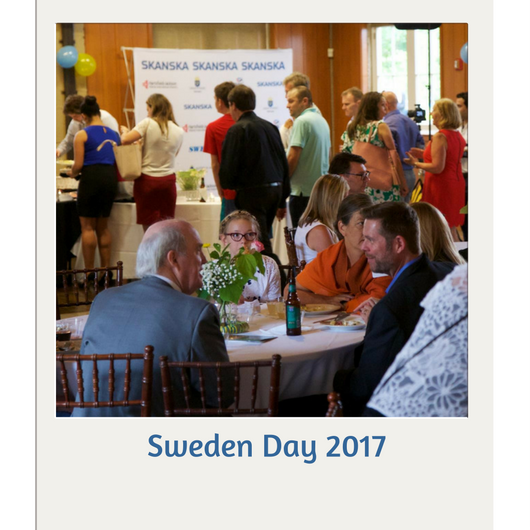 SACC-Georgia, The Consulate of Sweden in Atlanta and SWEA Atlanta would like thank everyone who attended Sweden Day 2017 on June 6. Over 140 guests joined us in the celebration of Sweden’s National Day at the beautiful Magnolia Hall, Piedmont Park. We enjoyed a Swedish Smorgasbord catered by Petite Violette, drinks, entertainment and Kubb Atlanta showcased the traditional Swedish game Kubb. It turned out to be a great Swedish summer celebration together with members and friends of the Swedish-American community in Atlanta, as well as international guests, local dignitaries and business partners. The Swedish pop artist Ulrika and her talented band delivered a fantastic performance during the evening showcasing Swedish music culture. SACC-Georgia was also pleased to announce the new Swedish Honorary Consul-Designate in Atlanta – Mr. Thomas Rosseland. Mr Rosseland is looking forward to serve the Swedish community in Georgia. Gold Sponsors: Thomas Concrete, Embassy of Sweden in Washington D.C.
A special thank you to Randy McDow at Randmc Photography who captured the evening in the fantastic pictures below. All pictures can also be found here and on our FB page. We wish you a wonderful summer and look forward to seeing you again soon! What kind of business is going on in this new headquarters with a mindset like this? Skaltek’s niche is to build machines to package cable with the least possible packaging material and precise amounts of the cable itself. The idea is that customers pay less for their branding and minimize costs all along the supply chain. Skaltek machines in the showroom/teaching arena allow customers to test drive the latest designs, and learn how to operate most efficiently. Machines are conceived with a minimalist philosophy, operating at the lowest energy possible, yet running extremely fast. “We’re in the empowerment business, where each person fulfills their own dreams…and is very productive to satisfy our customers,” says Ralph with light in his eyes. “We like to think of ourselves as a model for others, who view success as a vehicle to support community and the environment. Of course, the bottom line matters. Our current margins tells that story by itself.